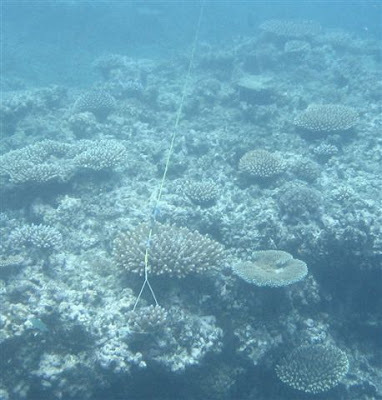 February came and it was time again for the Marine Ecology team to head out to Waitabu village for their annual biological monitoring of the Waitabu Marine Park. This year’s survey was both fun and quite successful. Despite the slightly few wet days at the beginning of the week, spirits remained alive through the week and we completed all surveys as per schedule. 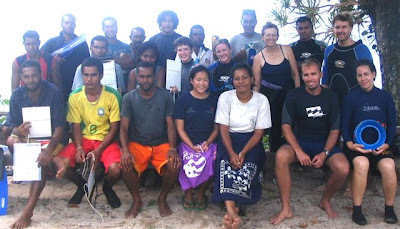 Helen and I were joined by Rosemary Dautei from Reef Safari’s, Rachel Dacks, Nic Turrentine, Natalie Parker, John Leonard, Leslie Currie and Grace Yeung (posted in the village) of Peace Corps Fiji. To be part of the week long activities was an experience for them and an opportunity for us to exchange ideas and share experiences. The village team of 11 volunteers were disciplined; excellent surveyors who definitely knew their stuff. Together we made a really dynamic team out of the Peace Corps, village surveyors and me, most of the time making sure we were doing it right. All this went on while Helen counted fish and saw to other matters of importance to the camp ground, village and home-stays. Back Row: Joe Saro (Boat captain), Grace Yeung (PC), Rose (RS), Tiko, Leslie (PC), John (PC), Natalie (PC), Nic (PC), Rachel (PC), Paulo. Middle Row: Kelepi, Chin (MEC), Eta (Park Manager), Paulo W.
My week began with the village children the Sunday afternoon I arrived in Waitabu. 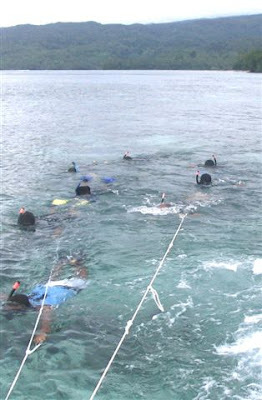 Thirty seven kids took part in a three hour marine education and conservation program. Children from as young as 3 to 15 years participated in the introductory marine education lesson, drawing and coloring in of the poster “Sasalu ni Waitabu” which translates into Waitabu’s reef resources. Positive responses were received from the children and at the end of the program they were all shouting “na lase e manumanu” meaning coral is an animal. Even if these kids got in only as much is satisfactory for me as many young and adults in Fiji are still unaware of this fact. Child busy drawing reef resourced. Dad Pita with 3yr old Sala busy coloring. The biological surveys began on a wet Monday morning with the Manta Tow in the Marine Park. Being dragged behind a boat is certainly a lot of fun but not when it’s raining and the water cold. We rounded up for the day completing the “Cawaki” (edible sea urchins) survey in the Marine Park and the fishing grounds. 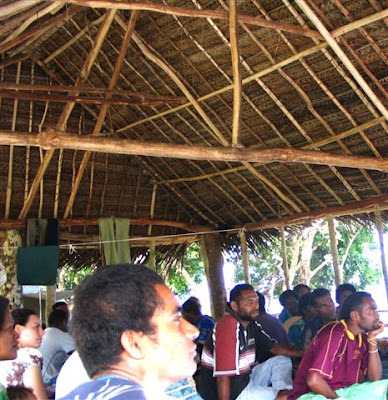 A refresher Reef Check training was conducted on Tuesday morning before we went out for the Giant Clam (Vasua) survey in the Marine Park and Trochus (Vivili) survey in the Marine Park and the fishing grounds. Practice Reef Check surveys were first carried out in the Rara (village green) and then in the fishing grounds on Wednesday morning to make sure everyone understood and knew what they were recording. Reef Check surveys were conducted in the fishing ground flats and at the reef edge after lunch on Wednesday. We had what we call perfect Waitabu morning when we woke up on Thursday. I had the opportunity to see the rising sun lying inside my tent (luxury!!!). The mountains behind the village glowed orange as the sun came up and the lingering smell of burning wood from the open fire kitchens in the village will be etched in my memory for years. Waitabu village on a bright Thursday morning. The 6 Peace Corps volunteers, Rose and I started off with the Socio-economic survey in the morning covering at least 20 households to gather basic data such as dependence on resources, livelihood options and attitudes toward the Marine Park . 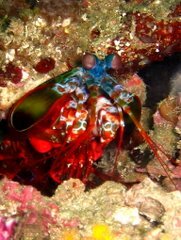 This will be analyzed for inclusion hopefully into the Fiji Locally Managed Marine Areas database. 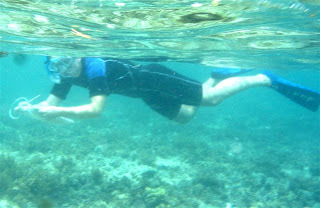 We finished Reef Check surveys in the Marine Park flats and edge later on Thursday afternoon and then everyone had a relaxing swim in the “tabu” area marveling at the unique color of corals and the abundance of fish. Through out the week we were well fed and looked after by Apisai’s family (Assitant Marine Park Manager). There were generous servings of Waci-poki (made out of taro leaves), pumpkin leaves in lolo (coconut milk), bele leaves in lolo, lobster, fish and the usual tinned fish and Maggi noodles at times. 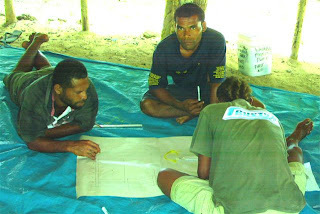 We had been doing data write-up and drawing posters and graphs everyday at the end of surveys and so didn’t have much to finish up on Friday morning as we prepared for the community presentations later that afternoon. The village survey team impressed me by agreeing to present the results of our week long survey to their community. Good on you boys!!! This certainly generated a lot of dialogue within the community members and we saw the benefit of having the village team presenting the results from their resources to their people. Community members and volunteers sharing survey results with community members. 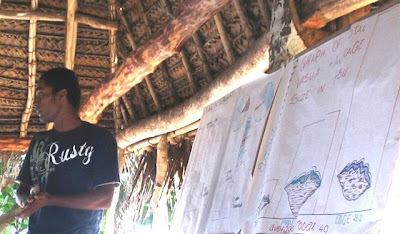 Rose Dautei of Reef Safaris explaining benthic habitat map. This was certainly a rewarding and memorable experience for me as the team proved that they could do this themselves when given the opportunity. I flew back home on Saturday morning with pleasant memories of the 2009 surveys in Waitabu. It couldn’t have been any better. For having lived in Waitabu, I feel an extraordinary willing from its inhabitants to protect and show the added value of such a remarkable environment. May we thank once again helen and Stuart, as Eta, Anthony and Okostino for their great job ? 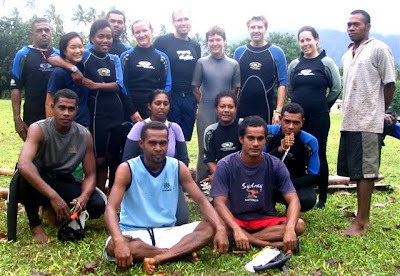 Surely a must-see part of Fiji Islands with such nice people. 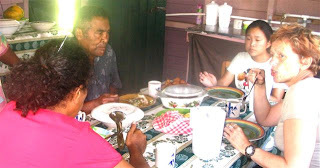 Vina'a va'alevu for all of them.